A few very exciting finds from Pagoda Red for those New Year's wish lists: shown above, a pair of antique painted lattice panels from South China circa 1900. The muted turquoise and green are so lovely together. 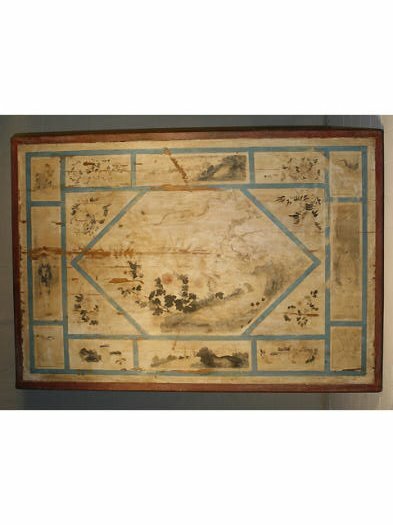 Below, a painted bed canopy from Shanxi, circa 1850, that measures 75.5 inches by 52.5 inches. It would be a beautiful focal point over a sofa. 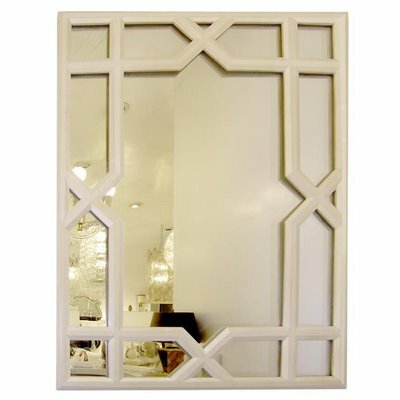 The Italian lattice mirror above is from the 1940s and is available through Capitol Furnishings. 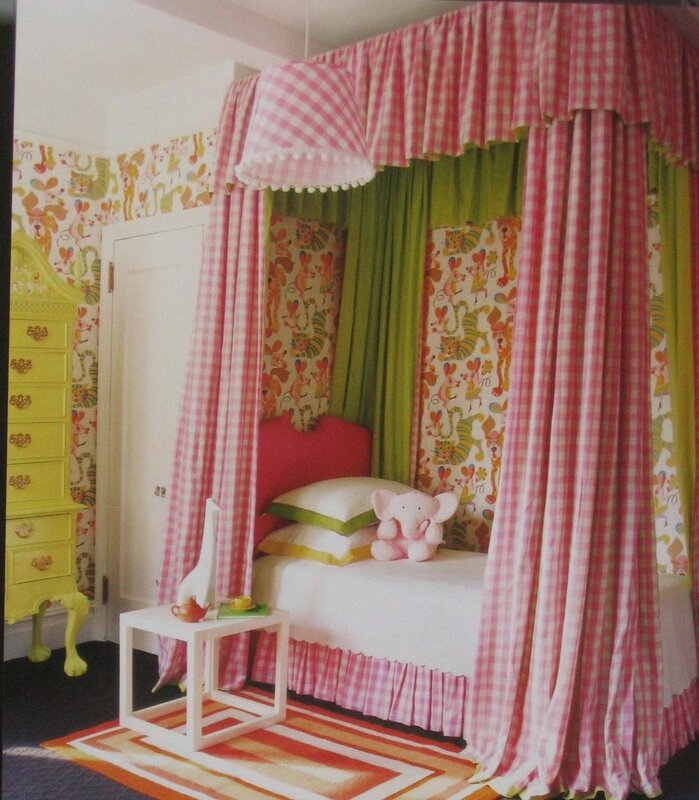 The bold trellis design reminds me of those geometric David Hicks carpets, circa 1970, as well as Kelly Wearstler's Imperial Trellis fabric, seen below made-up in a pillow designed by Anna Spiro. 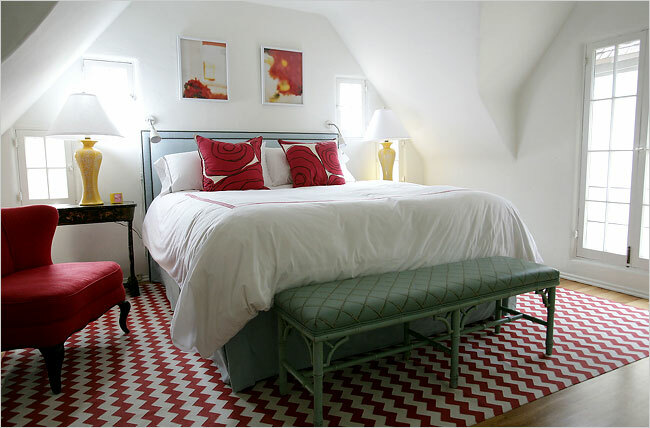 Legendary Harper's Bazaar editor Diana Vreeland said, "Red is the great clarifier -- bright and revealing. I can't imagine becoming bored with red -- it would be like becoming bored with the person you love." Above is another dramatic red lacquered piece from Woodson and Rummerfield. 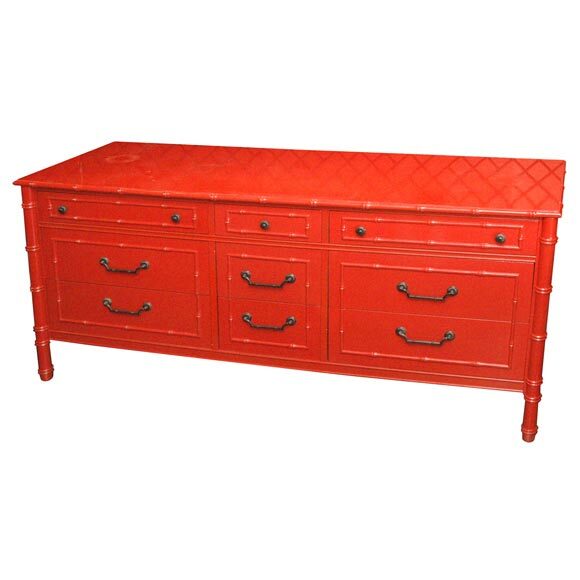 This 1950s chinoiserie sideboard (or possible bedroom dresser) would be great as the main shot of bold red in a room. Although for the person who, like Vreeland, can't get enough red, Woodson and Rummerfield says this item also coordinates with their red chairs that were my find of the week in early December. 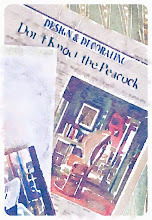 Recently, an interesting story,"For Designers Disciples, Home as Homework" ran in The New York Times. The focus was on assistants to well established interior designers, and how these employees decorate their own homes on budgets much smaller than those of their bosses' clients. Assistant to Ruthie Sommers, Krista Wooten was among those mentioned. Isn't her bedroom above fabulous? So fresh and well-edited. 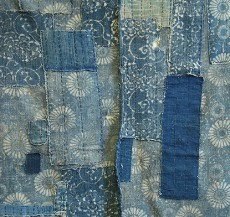 BTW: Here's a link to one of my first Sommers posts: Fresh Sommers Vibe. 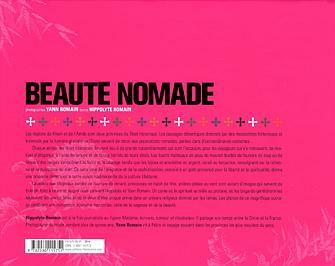 Above is the French version of the book, Tibet Style. The cover image, with those lush corals, reds and pinks contrasted against charcoal, is more striking to me than the English version, which features a man in a dramatic leopard trimmed coat. 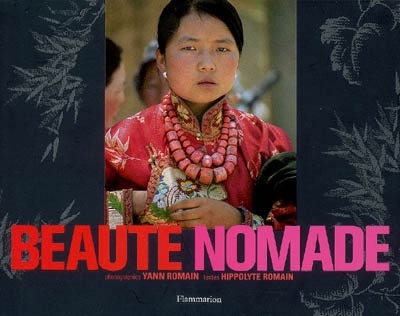 Even the title, "Nomadic Beauty," sounds more romantic. 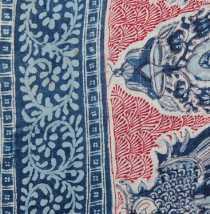 But both editions are filled with sumptuous fabrics and vibrant color combinations that could be inspirational for fashion and interior designers. 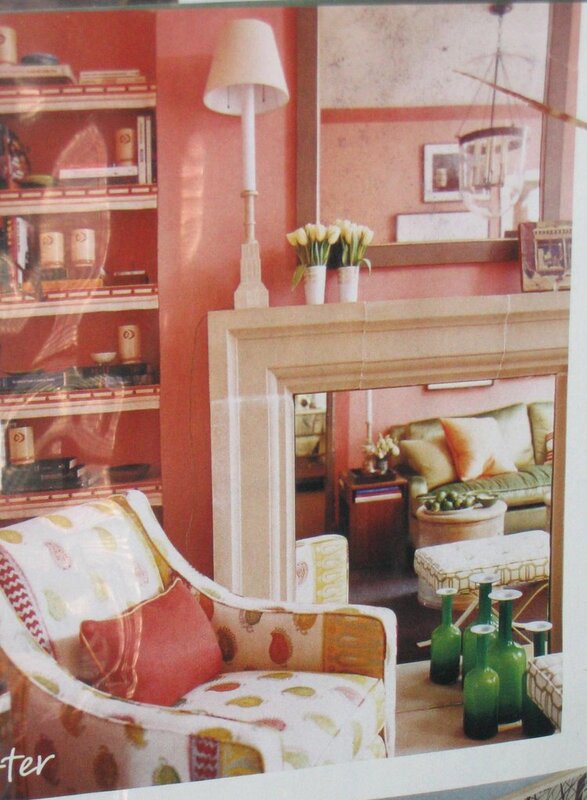 In her Hillcrest estate, Kelly Wearstler incorporated many Asian references and beautiful shades of pink, soft orange and yellow. Below is a view of an outdoor sitting area, as seen in Domicilium Decoratus. BTW: If you visit the site for the Viceroy Icon Brickell, you may notice similarities between Wearstler's design for this property and her Hillcrest residence. Look what Baker Furniture was creating in the 1960s: an Asian modernist buffet. 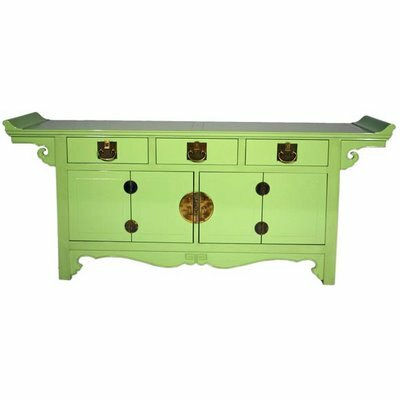 The dealer, NoHo Modern, says the piece has been refinished, so I don't know if that cool pale green lacquer was the color used originally. Above is another of those clean-lined vintage 1960s pieces that work so well in classic or modernist interiors. The dealer, NoHo Modern, describes it as a lacquered red-orange campaign desk with brass hardware. The creator is unknown. I like the subtle Asian vibe. 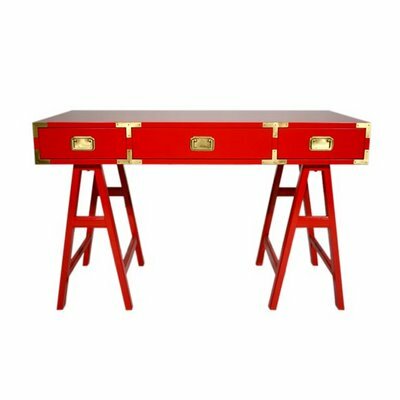 On a very loosely related note, I love how designer David Cafiero, who owns Cafiero Select, used this little red Chinese writing desk in actress Chloe Sevigny's East Village guest room, below, as seen in January's House & Garden. Photography by Francois Halard. For her shop, Black and Spiro, interior designer Anna Spiro has chic pillows made-up in Kelly Wearstler's Imperial Trellis, as seen above. Below, Imperial Trellis shown again, this time on an adorable little stool in a very classic living room photographed by Robbie Caponetto for Cottage Living. Below, designer Steven Gambrel used Wearstler's Emerald Cut, in the lotus/ivory colorway, on a stool in an apartment featured in the April 2006 issue of Domino magazine. 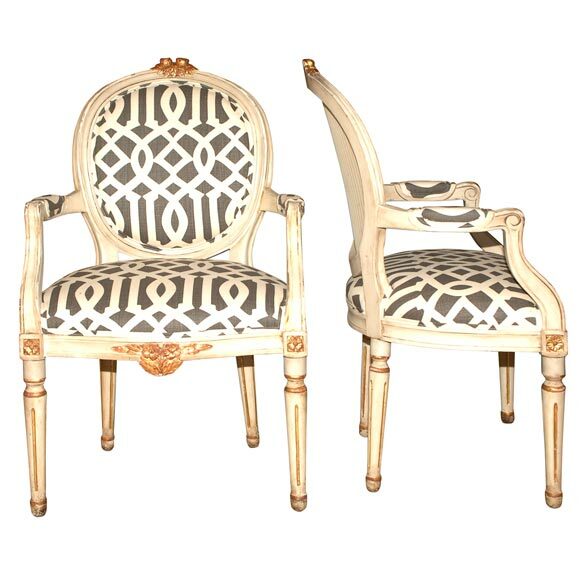 Below, 19th century Gustavain armchairs upholstered in Imperial Trellis. 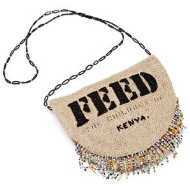 Available through Coup D'Etat. 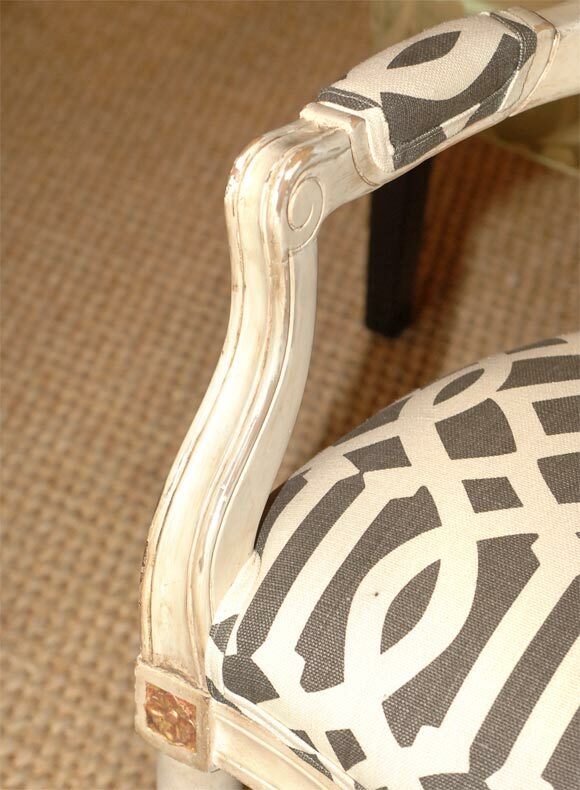 It seems the genius of Kelly Wearstler's fabric and wallpaper designs is their versatility. 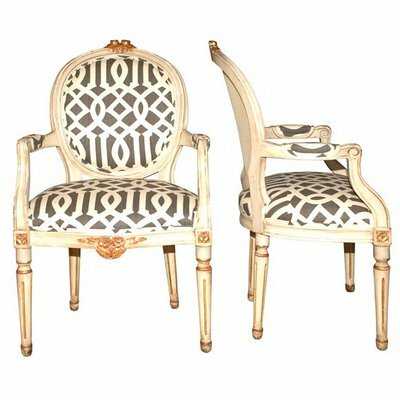 Sometimes the word versatile suggests neutral or bland, but of course Wearstler's designs are nothing if not dramatic and glamorous. 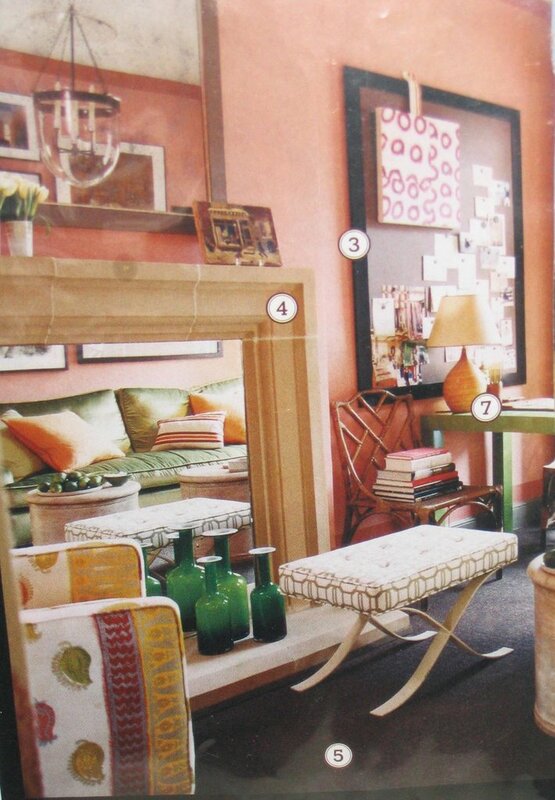 Yet her patterns and colorways are working in a wide array of interiors -- traditional and modern. 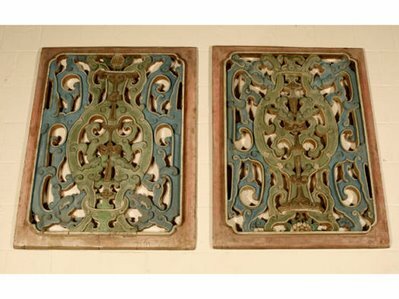 Several of her designs appear to be heavily influenced by classic Asian architectural patterns, which is interesting because Asian motifs have been so popular for centuries in Western interiors. 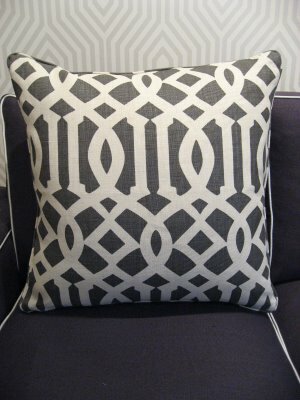 Personally, I love the idea of using a Kelly Wearstler pattern on a bench or pillow, to add punch to a room. 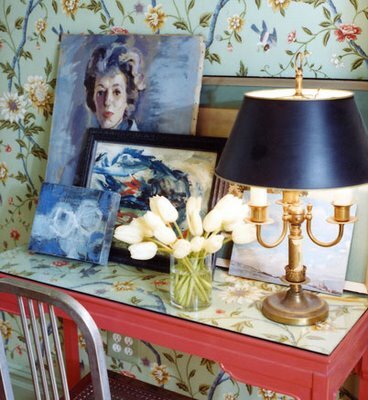 Not inexpensive but more attainable than wallpapering an entire room. Can't wait to see the Wearstler bed linens and tabletop items set to debut spring 2007. 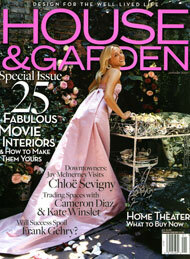 Have you seen the incredibly lovely cover of January's House & Garden? Both the cover and a feature story focus on actress Chloe Sevigny and her East Village home. 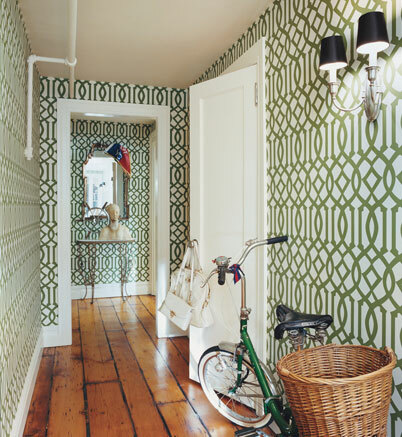 I adore the wallpaper in the entry shown above: Imperial Trellis from KWID. 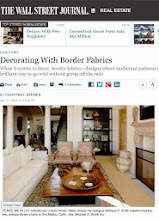 Also shown above in the garden are Sevigny and her decorator David Cafiero, who owns Cafiero Select. It's a beautiful spread. Photography above by Francois Halard. Attention design junkies: Kelly Wearstler, Jonathan Adler, Simon Doonan, Marian McEvoy and Muriel Brandolini are among the twelve taste-makers featured in Annie Kelly's upcoming book, Rooms to Inspire: Decorating With America's Best Designers. 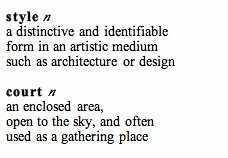 According to Rizzoli, the book highlights designers' own homes, so it will be interesting to see which residences of Wearstler and Adler are shown. April 2007 is the book's expected release date. 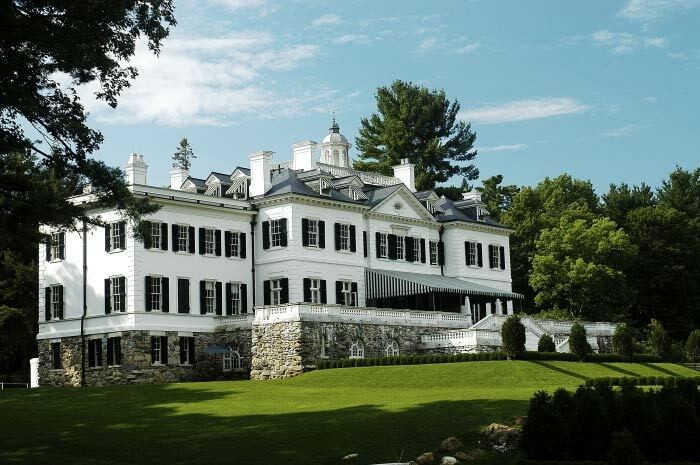 In 1902 Pulitzer-prize winning author Edith Wharton designed and built The Mount, shown above. Located in Massachusetts, it was her own extraordinary design laboratory, based on theories described in her book, The Decoration of Houses, co-authored with architect Ogden Codman, Jr. in 1897. During the 1980s efforts began to preserve and restore the estate, which is now deemed a National Historic Landmark. Today The Mount is open for public tours and serves as an education center. As you might guess, there is a Mount store with a great selection of Wharton's books. 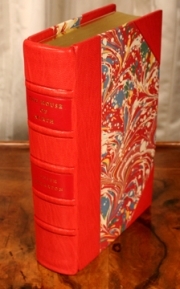 Currently in stock are special early editions of "The House of Mirth," exquisitely bound according to Wharton's personal preferences. Shown above, no two volumes are alike and the cost is $495 each. At the other end of the price spectrum are contemporary books available for $15. 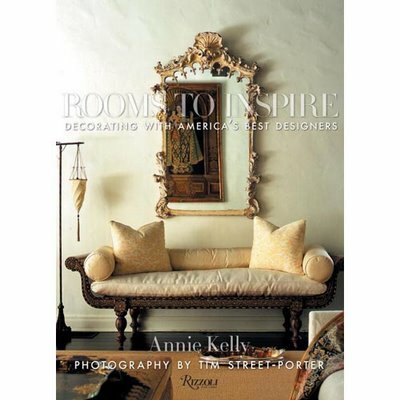 Since The Decoration of Houses still resonates with 21st century designers, Rizzoli is publishing another re-issue of the book in March 2007. 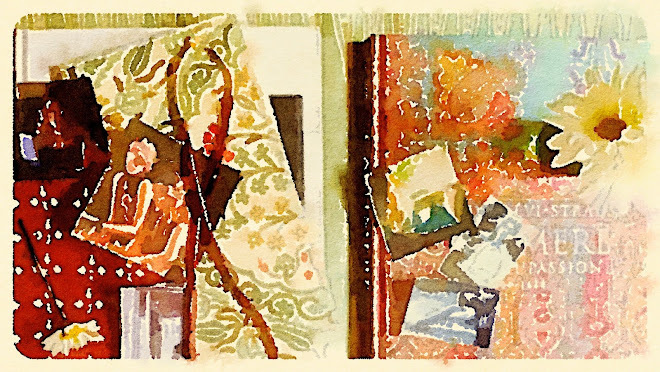 This edition will be a hardcover facsimile reproduced from the first edition, with decollage edges and all 56 original plates illustrating furniture, moldings, and interior styles. These days many vintage furniture dealers describe their lamps as "Billy Haines style," but this striking pair of circa 1959 green and black lamps, offered by Liz O'Brien, really was designed by Haines. Interesting lamps were a big part of the Haines look. 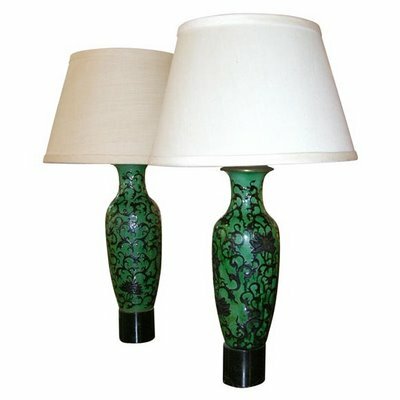 The pair shown here was made from crackle-glazed porcelain vases mounted on lacquered wooden bases -- perfect for a room that needs a shot of rich green. Other signature Haines lamps were often made from ceramic horses and chinoiserie figures. 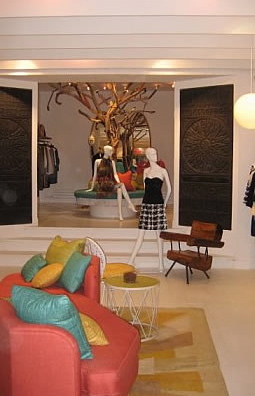 Here's what we have been awaiting: a peek inside Trina Turk's first New York boutique, designed by Jonathan Adler, at 67 Gansevoort Street. Turk says she was after a West coast, Big Sur circa 1970s vibe, and selected Adler because of his work on the Parker Palm Springs. 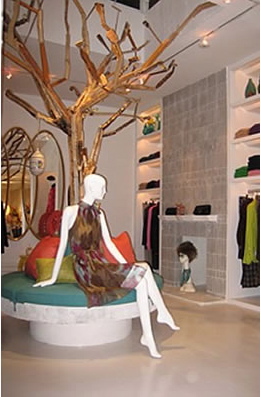 Turk's California boutiques were designed by Kelly Wearstler. I love that branchy tree Adler used! What do you think? 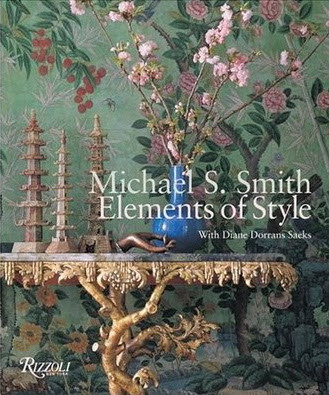 Last December I was fortunate to attend an informal talk given by designer Michael Smith Since then, my copy of Michael Smith Elements of Style has seen a lot of use but I'm doing my best to preserve the book jacket because I think it's so beautiful. Inside the book, the caption for the image used on the cover reads "Chinoiserie Dream." 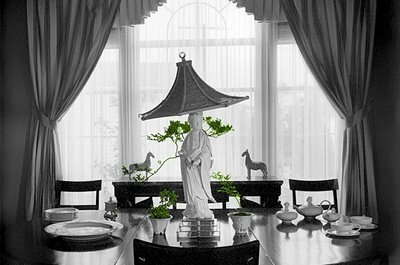 Soapstone pagodas, flowering branches in a Chinese vase, and vintage chinoiserie wallpaper are a few of the Asian elements that comprise the vignette. For authentic China chic -- Imperial yellows and intense reds -- and more design inspiration, Smith recommends the films The Last Emperor and House of the Red Lantern. I'm familiar with Raise the Red Lantern but I can't find House of the Red Lantern anywhere. I finally have the 25th anniversary December issue of World of Interiors, and I rate it a must see. 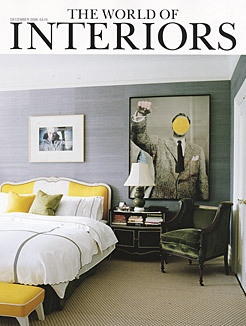 Kate and Andy Spade's New York apartment (seen here above and on the magazine's cover) is featured along with a story on venerable British decorator John Fowler, who is currently the subject of a retrospective exhibit, "John Fowler: Detail in Decoration" on view through January 21 at the Victoria and Albert Museum. The December issue also comes with a companion magazine filled with "Best of" spreads from the past 25 years. One residence highlighted is Chatsworth -- the private quarters. Marie Antoinette's cabinet of movable mirrors made the issue too. William Haines Designs features archival photographs of the legendary designer's work, fabulous quotes from Haines such as "Design is an opinion, not a profession," and reproductions of original Haines furniture that is now available through Lindley & Associates and select dealers throughout the United States. Related posts: Billy Haines and Billy Haines To-Die-For Coffee Table. 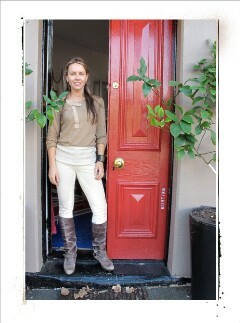 Anna Spiro is an interior designer to watch. Based in Australia, Spiro has a very sharp eye. 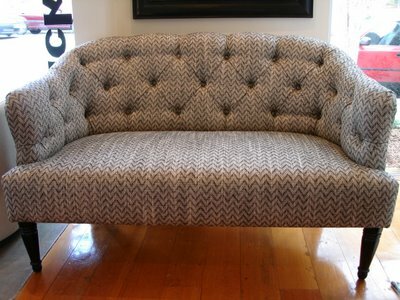 Case in point: the sofa she designed, above, upholstered with deep button tufts (as we say in the U.S.) and a new pattern from Mokum. Recently, the young designer launched her own blog, Absolutely Beautiful Things, and a site for her shop, Black and Spiro, is under construction. 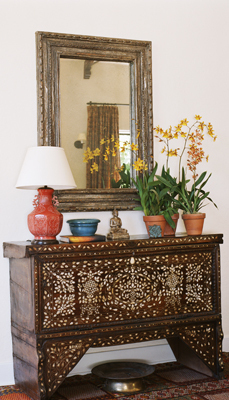 The gorgeous inlaid chests of drawers below are samples of the sort of pieces she selects for the store. 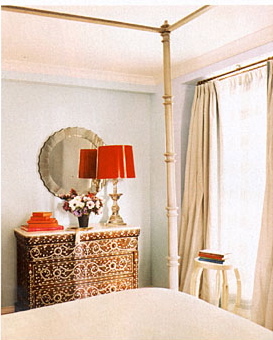 When I saw Spiro's chests, I thought of a similar piece used in a very well edited bedroom designed by Emma Jane Pilkington, which was featured in HG January 2005. Here it is below. 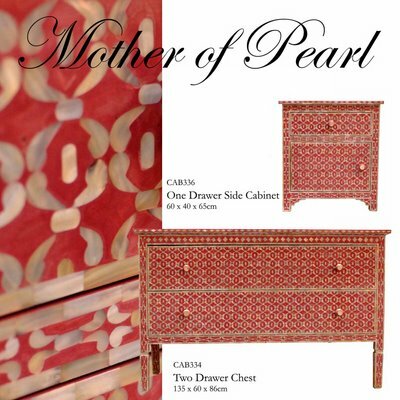 BTW: If you like inlay work, don't miss Mother-of-Pearl. 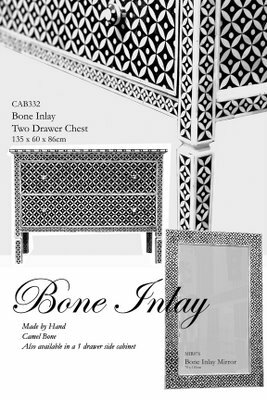 Below is one more amazing chest with what appears to be bone or mother-of-pearl inlay, in a room designed by Schuyler Samperton and Anna Hackathorn. 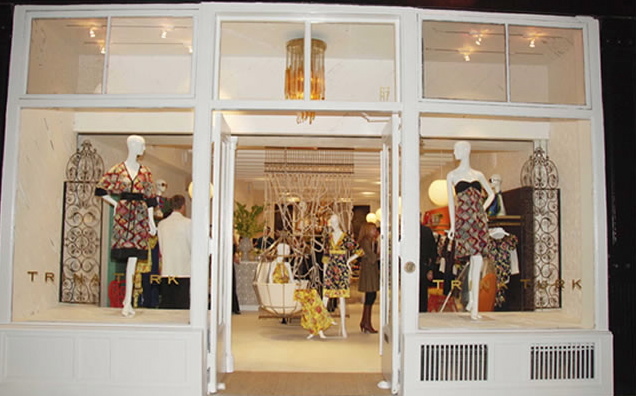 Many of us are anxious to see Jonathan Adler's design for Trina Turk's first New York boutique, which is now scheduled to open December 6. Also there's excitement about the upcoming January debut of Bravo's series, Top Design, in which Adler will serve as a judge. 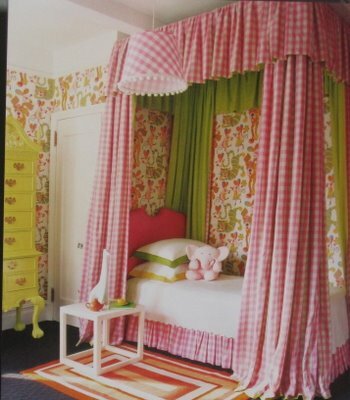 So while we wait, I thought I'd post this fun little girl's bedroom designed by Adler. 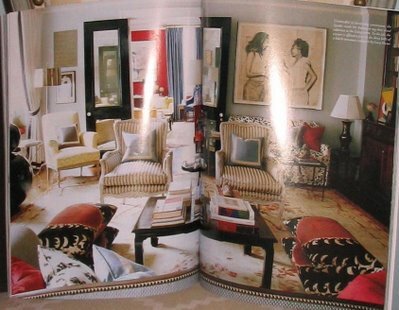 The images above are from Adler's book, My Prescription for Anti-Depressive Living, but this room was also featured in a 2005 Elle Decor spread about Jane Wagman's NY apartment. 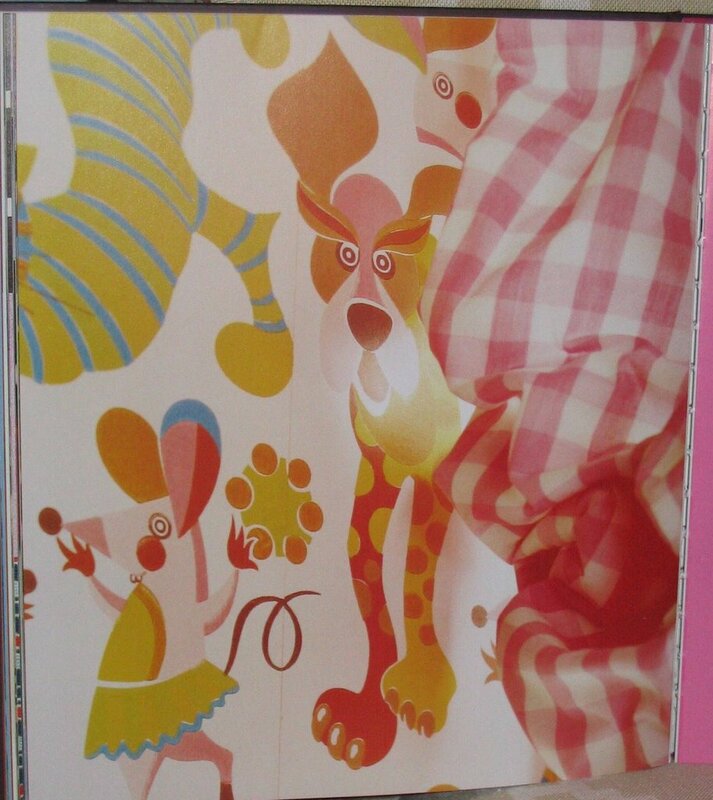 Whimsical vintage animal print wallpaper is the major player in the room. It is sweet, bold and very youthful. 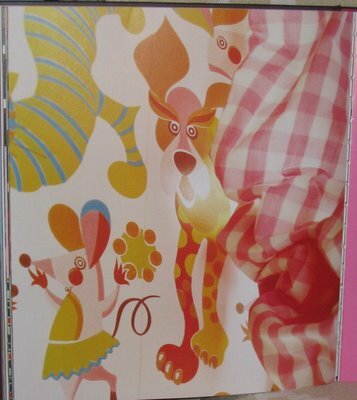 Alas, everything that makes the wallpaper so cool is what also makes it an extravagance for many budget-minded parents who think about longevity when decorating their children's rooms. But that fabulous lime-green lacquered Queen Anne highboy in the corner is a different matter. There are many similar looking, well-made but not too valuable, highboys (chests) out there that could be painted any sorbet shade. Years later, the piece could be painted glossy black or Chinese red -- whatever the grown-up girl wants.